This was the finding of a report issued last week by the anti-hunger charity Share Our Strength, based on a survey of 500 low-income parents and their teenage children in public schools. Some 325 teachers were also interviewed. “Low-income” was defined as at or below 185 percent of the official poverty line, or $45,417 a year for a family of four. Among children in low-income families, 59 percent said they had gone to school hungry. In the richest country in the world, with the largest concentration of billionaires, one in six children faces hunger, some 13 million in all. The survey found that 59 percent of the parents reported that their food ran out before they could buy more; 48 percent couldn’t afford to buy enough food each month; and 23 percent had been forced to cut the size of their children’s meals because of a lack of money. Children were under increasing stress from hunger. Some 55 percent of children knew their parents were worried about running out of money for food, while 35 percent shared their parents’ fear. Among those teenagers in low-income families, 42 percent experienced sadness caused by hunger and 41 percent experienced anger for the same reason. Many teenagers reported deliberately going hungry to make sure that younger siblings could have enough to eat. Among low-income families, 92 percent had at least one adult in the household working full-time, part-time or in multiple jobs. Hunger is thus the byproduct not only of poverty, but of the precarious and contingent character of so many jobs and the lack of any meaningful social safety net. Among low-income parents, 64 percent said that a single unexpected large bill—a $1,500 car repair or medical expense—would make it difficult to feed their children. Hunger is an increasingly serious obstacle to learning. 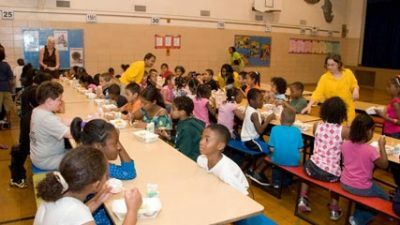 Among teachers questioned in the survey, 92 percent said that hunger had an impact on their students’ learning, 80 percent saw loss of concentration, 62 percent saw behavior problems, and 47 percent saw students suffering additional health problems. Nearly three out of four teachers regularly saw students come to school hungry, and nearly two-thirds of teachers reported regularly buying food for students who were not getting enough to eat at home, spending an average of $300 a year of their own money. Children had an overwhelmingly positive response to their schools providing breakfasts and lunches. Three quarters said school meals helped them feel better, pay more attention, behave in the classroom and get better grades. He noted that programs like food stamps, school meals and WIC (Special Supplemental Nutrition Program for Women, Infants and Children) had a major impact in alleviating hunger. But these programs are targeted for severe cuts, if not outright destruction, in the budget proposals of the Trump administration and congressional Republicans. According to a report published Thursday by the Center on Budget and Policy Priorities (CBPP), the House Republican budget plan, scheduled for a vote in early September, would slash $2.9 trillion from programs for low-income and moderate-income families over the next ten years. State governments would be enlisted to do the dirty work, by transferring to them the authority to reduce benefits and increase eligibility standards. The budget would also limit “community eligibility,” which allows schools in high-poverty areas to provide free school meals to all students without documenting the income of each individual student’s family. Cuts in low-income entitlement and discretionary programs account for half of all the cuts in nonmilitary programs proposed by the House Budget Committee, although these programs make up only one quarter of the federal budget. While the Trump administration and the congressional Republicans propose to deal with the deepening poverty and social misery by deliberately making the conditions worse, the Democratic Party offers no alternative. The Democrats are not demanding hearings over hunger or the impact of the proposed budget cuts. During the month-long legislative recess, when senators and representatives sponsor political events in their states and districts to highlight issues of concern, the Democrats are focusing on allegations of Russian interference in the 2016 elections and alleged collusion by the Trump campaign as part of a broader effort to whip up a war fever directed against targets of the Pentagon and CIA, in the first instance Russia. There are no events spotlighting the dire conditions of life for tens of millions of working people. As for the Democrats’ latest political offering, the so-called “Better Deal” program unveiled last week, it makes no mention of poverty, hunger, homelessness or even unemployment, proposing to use the power of the federal government to boost the interests of “small business and entrepreneurs” and defend “Main Street” against “Wall Street”—i.e., favor one section of business against another. Featured image is from ActiveRain.